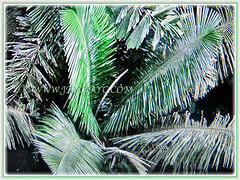 Seje Palm or Pataua Palm is a very attractive, evergreen and fast-growing palm. 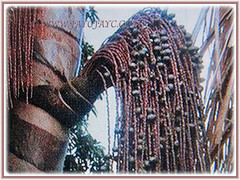 A multipurpose tree, it is highly recommended for cultivation as an oil and fruit crop. Its thin and oily mesocarp has chocolate-like taste and is very popular. Usually found in the tropical rainforests of South America, in a wide range of growing conditions from swampy lowlands to mountainous regions. Botanical Name: Oenocarpus bataua (syn. : Jessenia bataua/polycarpa, Oenocarpus batawa, Oenocarpus seje). Etymology: The genus Oenocarpus is derived from the Greek words oinos for wine, and carpos for fruit. Origin: Native to Panama and northern South America. 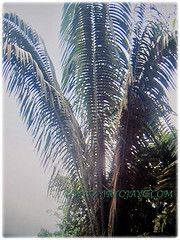 Features: Oenocarpus bataua is from the genus Oenocarpus that consists of 9 species of palm trees. A fast-growing solitary palm with a straight trunk, growing between 10-25 m tall with mass of prop roots at base. Its trunk is 20-30 cm in diameter, smooth and obscurely ringed with leaf scars. Evergreen leaves have 10-50 cm petioles with 3-7 m long rachis and palmately lobed. 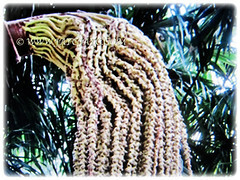 Large, feather-shaped fronds are composed of dark green and glossy leaflets up to 2 m long and 15 cm wide which hang downwards. There are 10-16 leaf terminals and approximately 100 leaflets to each side as well as placed in the same plane. The leaflets are uniformly distributed on the rachis in the median part. Its unisexual flowers are polycarpic. Inflorescences up to 80 cm long are multi-branched, yellow in colour and emerge from below the fronds. Male and female flowers are creamy white or yellow with 2 mm sepals and 7 mm long petals. The fragrant flowers are arranged in a thick and stringy inflorescence that resembles the head of a mop. E Each blossom is 1-2 m long with about 300 rachilas up to 1.3 m in length. Eventually, the flowers will be followed with smooth and glossy purplish-black fruits that resemble olives. The reddish-pink, hard flesh is oily and has a chocolate-like taste. 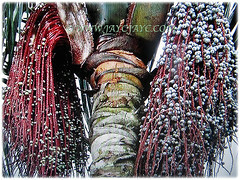 Culture (Care): Oenocarpus bataua or Seje Palm can be grown easily with least maintenance. Soil: Humus-enriched, sandy, moist and unflooded soils. Others: Once every quarter, feed the palm with a slow-release granular fertiliser formulated for palms that has nitrogen, phosphorous, manganese and potassium. Generally, it is free from serious diseases and pests. However, do watch out for the West Indian cane weevil. 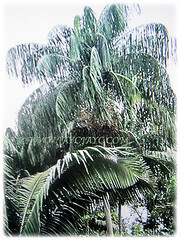 Oenocarpus bataua or Seje Palm grows best in areas where annual daytime temperatures are within the range 21-28°C but can tolerate 17-32°C and abundant precipitation. When dormant, the plant can survive temperatures down to about 5°C. However, it cannot tolerate cold winters for long and show signs of brown splotches on the leaves and will wither. Propagation: Easily propagated by seeds and requires a shady position to germinate. Usage: The fruits of Oenocarpus bataua or Seje Palm can be used to produce oil which is of excellent quality and was used as a substitute for olive oil during WW2. Its edible fruits are added to beverages, ice cream, and popsicles. The fruit is soaked in water to soften the flesh before eating. Their wood is useful for handicraft and is used to make flooring and other building materials. The rachis have been used to manufacture arrows and the leaves to make baskets and construct provisional housings. Traditionally, pataua oil is used by Amazonian communities in fried foods. It is also used in cosmetic production because it can be used as a tonic to soften the hair. The oil is used in traditional medicine to treat cough and bronchitis and to fortify the hair.